[Competition] Decorate Your Profile for New Year! 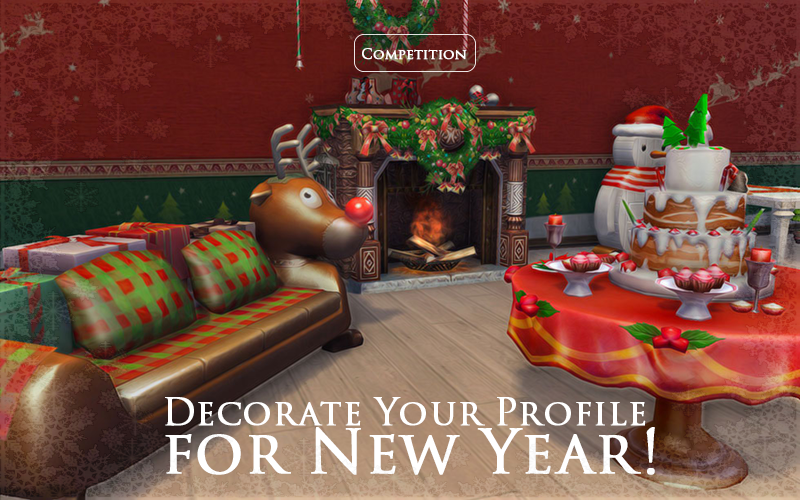 New Year is closer and closer, this means that it's time to decorate not only homes, but also profiles! We start a competition for the most festive decoration of your profile! Additional information: The competition will be assessed according to creativity, theme correspondence and festivity of decorations. "Personal style" decorations are welcome. This means, that if your profile is already decorated, you can just add some New Year details. As with the decorating home, you don't need to create something completely new and unique, but just add some details to the existing "interior". So, if you haven't changed your avatar from the day of register, you can just add a small details as a Santa's cap (if it is character, see the example) or any other decoration. All the types of formats are allowed: gifs, videos, pictures/illustrations /arts/screenshots, various types of cliparts and other graphic elements. Only the profiles with the New Year, festive decorations are accepted for the competition. Profile in this case means avatar, sign, profile photo. The use of pictures which can in some way abuse or/and humiliate dignity of users, players, administration members is prohibited. The use of profane language and other phrases provoking agression is prohibited. Signs containing huge amount of materials are published in spoilers. Users can affirm their participation in the competition by leaving a comment "Participate" in the special topic. The works are accepted through the special topic. Every participant must write their I game nickname and side (asmo/Ely). The winners will be chosen by the voting of Administration.